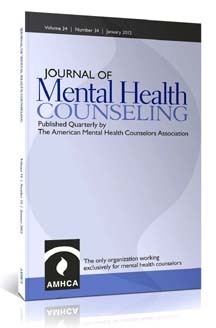 AMHCA's leading publication, the Journal of Mental Health Counseling, can be found at www.amhcajournal.org. MHCs work in a variety of clinical settings with diverse client populations. This section emphasizes cutting-edge strategies and techniques as well as innovative applications of established clinical practices. Articles provide critical analyses of the existing literature and descriptive application of clinical approaches, strategies, and techniques. Explication of theoretical constructs and their application in clinical mental health practice are the emphasis of this section. Theoretical articles must be well grounded in the existing conceptual and empirical literature, delineate implications for practice, and provide illustrative applications (e.g., case studies). This section allows for dialogue among MHCs regarding dilemmas, challenges, divergent perspectives, and other emergent topics relevant to clinical mental health counseling. This section addresses empirically supported best practices, evidenced-based approaches, and new developments in clinical mental health counseling. Articles include implications for professional mental health counseling practice and future research. Provide a dedicated space for neuroscience manuscripts in the counseling field. Identify clinical outcomes in an era of neuroscience. Generate and evaluate new theories and techniques of clinical mental health counseling grounded in neuroscience principles. Replicate and validate existing psychotherapy research within a counseling framework. Increase exposure to the RDoC in the counseling field. Create an independent body of neurocounseling literature. AMHCA members have free access to all electronic issues of our journal and unlimited downloads. The journal is available in a fully searchable database-driven format. The journal is electronically delivered to AMHCA members four times per year, in January, April, July, and October. Print subscriptions are also available to members for $25. Members can download all electronic journal articles at no charge. Non-members may access tables of contents and abstracts or purchase full-text articles. Non-members can download journal articles for $25 per article. The quarterly Journal of Mental Health Counseling (JMHC) provides clinical mental health counselors and researchers with practical knowledge and illuminating background from in-depth research on clinical studies and counseling practice.